This Nutella Fudge is the best fudge I have made to date! I have a slight addiction to Nutella and can often be found sneaking a rather large spoonful or two from the jar. Thats one of the reasons this recipe is so amazing. If you love Nutella you absolutely have to give this a try! Sweet and creamy fudge sprinkled with a touch of sea salt for the perfect blend of flavors in each and every bite! Trust me when I say you do not want to pass this recipe up! It would make a fantastic addition to your holiday plates this year! This fudge is SO delicious and addictive! 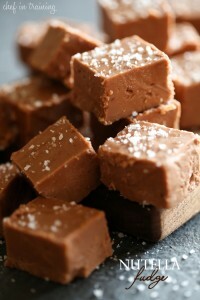 Sweet and creamy Fudge sprinkled with a touch of sea salt.... It is perfection! Line a 9x9 baking dish with foil. Make sure to leave over-hanging edges with the foil. Set aside. In a large sauce pan over medium heat, melt butter, sugar, brown sugar and evaporated milk together, stirring constantly and bringing to a full rolling boil. Continue to boil and stir constantly for 4 minutes. Remove sauce pan from heat and stir in marshmallow cream, Nutella and vanilla until smooth. Pour into prepared pan and evenly spread and distribute. Sprinkle sea salt evenly over the top of fudge. Once fudge is set, remove from fridge, carefully lift out the fudge with the overhanging. Cut into about 1 inch squares. How have I never thought of making nutella fudge!? It's brilliant! I can't wait to try it. Omg this cannot be bad: Marshmallow Cream, Nutella, butter, 2 kinds of sugar...Love it :) I love Nutella too, so much, and it's good this is not in my house :) Pinned! You had me at Nutella....these look divine! Just made this and it's cooling now. Of course I had to leave some in the pan for tasting! Very nice flavor. I would make this again. Could this be made with a nut-free chocolate spread (like Hershey's) instead of Nutella? I believe it has the same consistency, but I'm not really sure how it would respond to heating. Made this over the weekend, and everyone loved it!!! I made this for the second time to take to a hockey game for the off ice officials, writers and pr dept. for both teams. It got rave reviews and please make it again. The only thing I need a little different was to boil and stir for 6 minutes instead of 4 to just try and make it smoother, the fudge melted in your mouth. Thanks again. I have been instructed to make it again. Just made this and it is the best fudge I have had! Seriously, it is so smooth, it's like ice cream. It's the first time I've ever used sea salt and so glad I did. The little bits of salt that crunch in your mouth with the sweet, sweetness of the fudge is an oral delight. Hi, I made this last night...the flavor is perfect but it's not setting. Any thoughts on what might be wrong? Thanks! Hi I'd like to make the Nutella fudge but was wondering where do I get the marshmallow cream from? I live in Sydney Australia and I don't think we have it here, what could I use as a substitute? The very best recipe for chocolate fudge ever!! I have made this way too many times to count. Everyone that I have shared this with want the recipe. Delicious and the only fudge recipe I will use in the future, period. I love ur recipes and I swear by them! Is there anything that can be substituted with marshmallow cream? It's not available where I live. Easy and delicious! Not a heavy fudge, a creamy, light, rich tasting treat!